Hope you've all had a fantastic week so far? The past two weeks I've been going through a bit of a lull with my blog, so I'm easing myself back into it with a few different posts. When I feel like this I find that it's so important to give myself the time I need to get my motivation back, this blogging stuff ain't easy! It's quite nice to have a Sunday off without having to take up 5 hours to shoot and write! However, I will back soon with lots of new content. 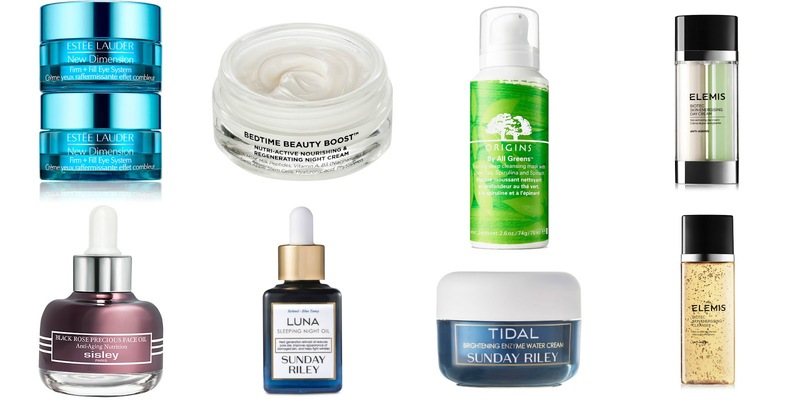 In the meanwhile I wanted to share some products from my current skincare wish list, as I'm sure most of you will already I'm a totak skincare Junkie! I would love to hear from you lovelies below, is there anything you've tried or would like to try? I would also love to know if you think a certain product is worth the hype or not? After watching one of Fleur De Forces recent videos I found out about the Estee Lauder New Dimension Firm + Fill Eye System. I really like the idea of having a system with two different products and textures! Step 1 is firming gel that is designed to create a tighter and more toned look to the under eye area. Step 2 is more of a filler that features light-diffusing optics to smooth and brighten. I love Estee Lauder and I'm currently using another EL eye-cream... maybe this will be next?! I must admit sleep is not my friend, so anything that offers a slightly more relaxing bed-time experience is instantly attractive to me. I feel like OSKIA is such a well loved brand, but I haven't ventured that far into the brand. The OSKIA Bedtime Beauty Boost is designed to hydrate, brighten and anti-age over night. I'm all about a maintaining a youthful glow! The past month has been a pretty testing one and life has definitely thrown a few spanners in the works! My skin has taken a bit of a toll an usually I will get 1-2 spots a month. However, right this moment I have 4 all at once! I definitely think the Green Tea, Spirulina and Spinach within the mask would help to deep clean my skin and unclog any pesky pores waiting to break out. Elemis were the second high-end skincare brand that I ever tried and I feel like they are responsible for the devotion and care I have shown my skin. I've also worked within an Elemis Spa and all the training I received was truly inspiring. I definitely think the Elemis Biotec Skin Energising Day Cream will be next on my list after I finish my current face cream. It's scientifically proven to help increase cell energy and uses a patent-pending BIO-ENERGY complex of encapsulated Zinc and Copper to energise the skin! I was lucky to try this within a beautiful gift with purchase. However, I haven't quite been able to push myself to fork out over £130 despite falling in love with the sample. With an array of anti-ageing ingredients and plant-based active ingredients, I feel like this would possibly be suited to more mature skin. However, whilst I was using this face oil it felt like someone had turned a light on, my skin was so fresh and glowy the following morning and I'm pretty tempted to purchase this as a birthday treat next month. I do love a good old night oil and there has been so much buzz around Sunday Riley recently! The Luna Sleeping oil sounds like a total dream and it's ingredients list of cold pressed avocado chia and Concord grape seed oils sound good enough to eat. I definitely want to try this at some point, but I'm a little unsure whether or not to stick with my Estee Lauder ANR for evening use! Can you tell I'm lusting after Sunday Riley right now? After falling in love with their Blue Moon Cleansing Balm, I'm really eager to try a few more products. The Tidal Brightening Enzyme Cream is currently on order, as it sold out instantly. It is designed to deliver a big injection of hydration via two forms of hyaluronic acid, which increases hydration by 68% in 15 minutes. The Biotec Skin Energising Cleanser not only looks beautiful, but promises beautiful results too. I actually had the chance to purchase this recently, but after a facial I was recommend different products and decided to go with what my skin needed instead. I still want this though and I'm eager to try it in the near future as it sounds fantastic. This is definitley a luxe-list and I would love to hear if you know of any dupes for the products above? Please note this is not a sponsored post! Also wanting to try the OSKIA bed time beauty boost but the price tag makes me recoillllll!